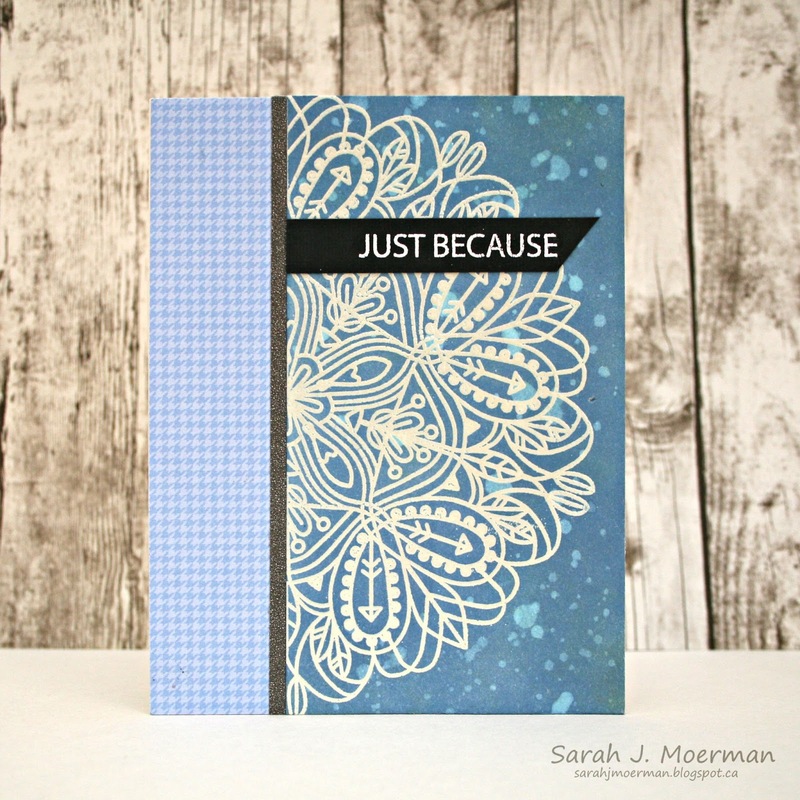 I'm here to share a set of cards created with the beautiful Simon Says Stamp Emma Background Stamp and Jumbo Stripes Stamps paired with Distress Inks and Distress Oxide Inks. Read through to the end of the post to see who the winner of the Simon Says Stamp May Card Kit is. 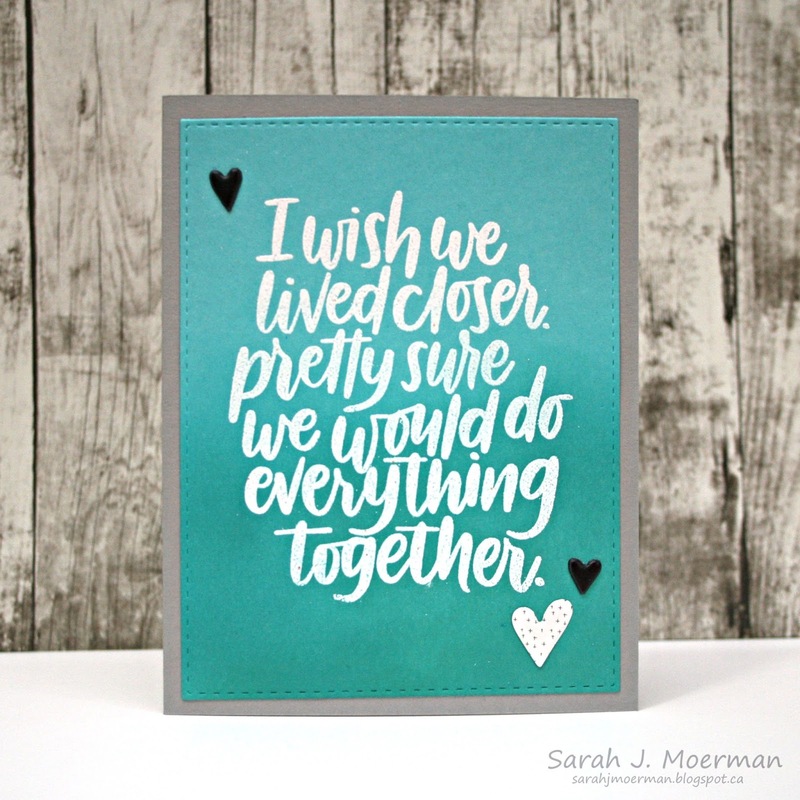 I heat embossed Simon's Emma Background with White Satin Embossing Powder on nine pieces of Canson Watercolor Paper. I then ink blended Distress Inks and Distress Oxide Inks, spritzing the panels with Sparkle Shimmer Spray. 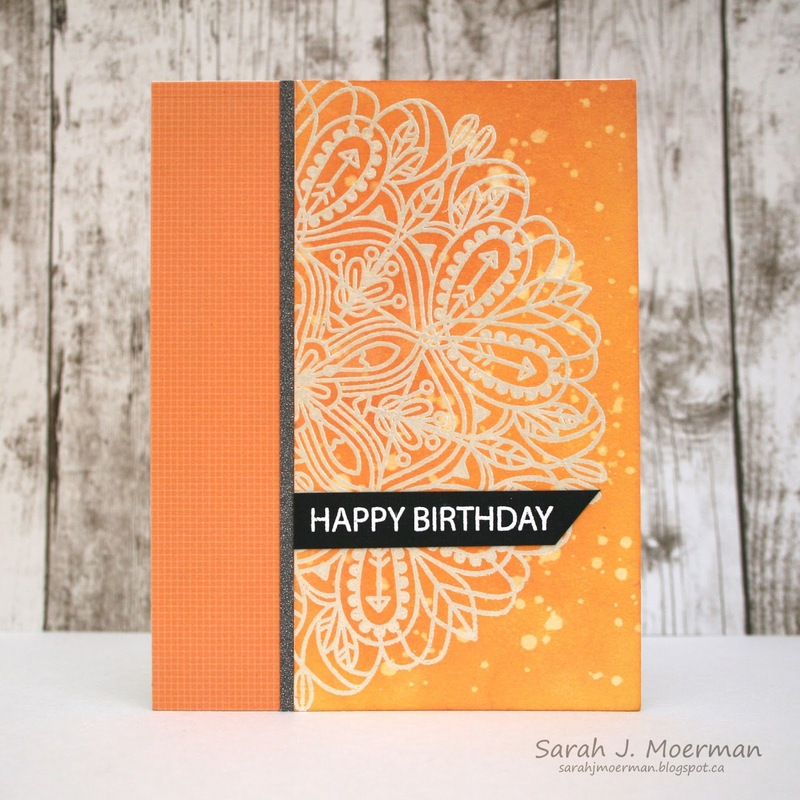 I adhered the panels to notecard, added strips of patterned paper and charcoal glitter paper. 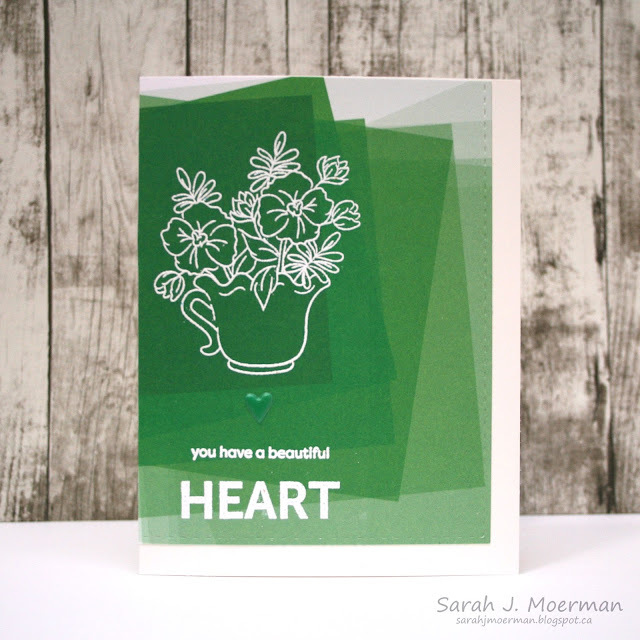 Finally, I white heat embossed sentiments from Simon's Jumbo Stripes Stamp Set on strips of black cardstock and adhered them to finish off the cards. 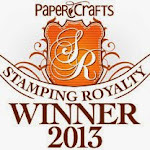 Before I go, I'd like to announce the winner of the SOLD OUT Simon Says Stamp May Card Kit. Perfect pairing of stamping and stickers on this pretty card. Congrat! 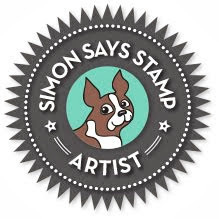 Please message me with your mailing address so I can pass it on to Simon Says Stamp. 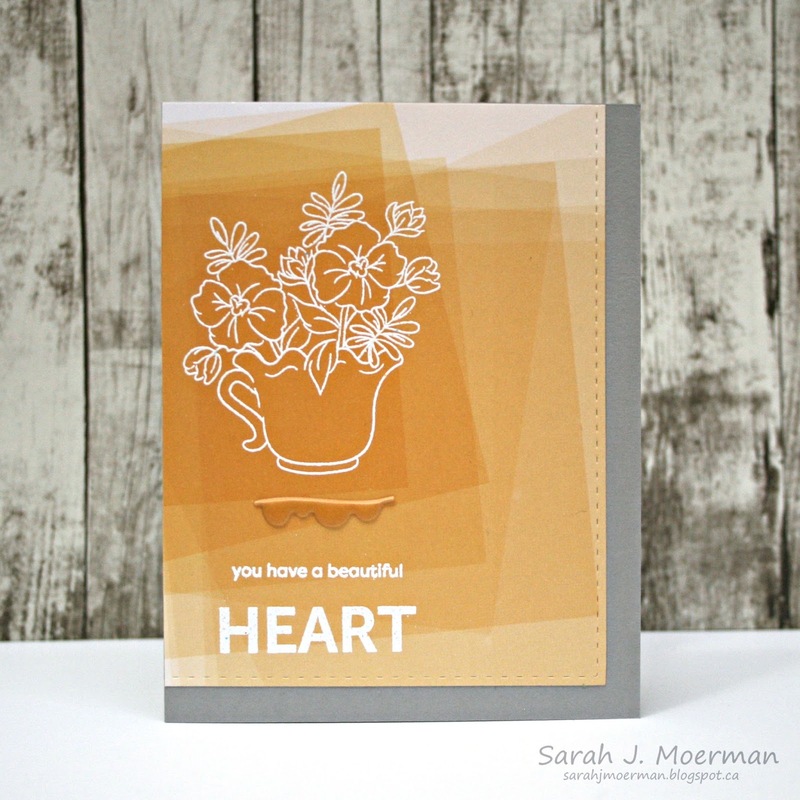 I'm stopping by to share a final card featuring the Simon Says Stamp May Card Kit: Kind Heart! 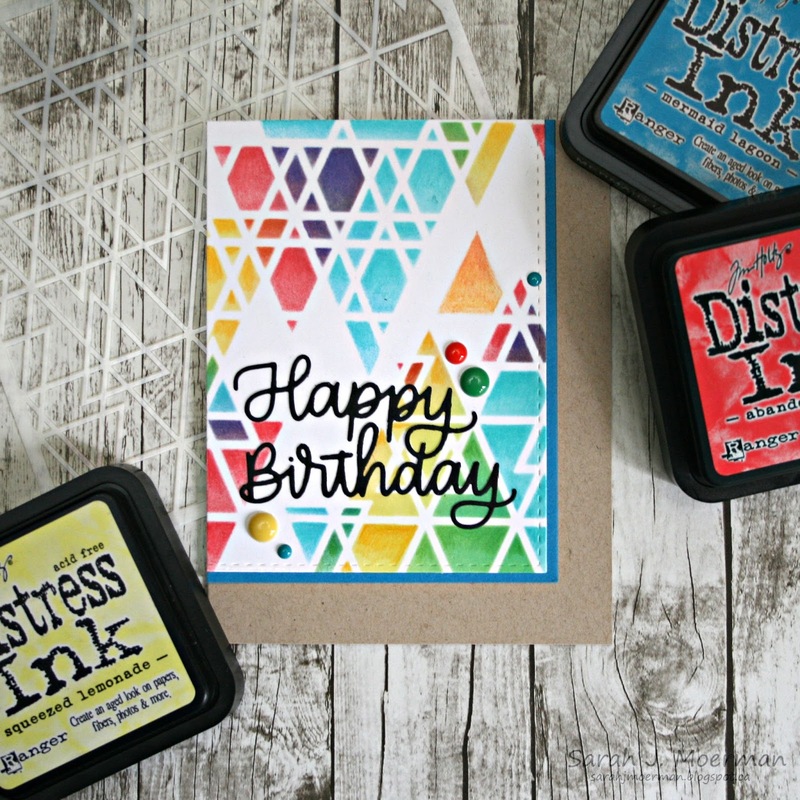 I really wanted to showcase the two Simon Says Stamp ink cubes that came in the May Card Kit. 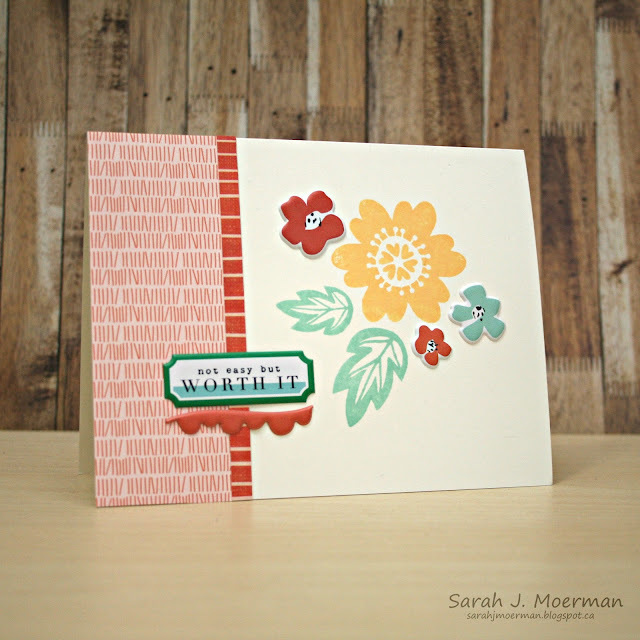 I decided to pair the stamped Everything Together flower and leaves with flowers from the Pinkfresh Studio Let Your Heart Decide Puffy Stickers. 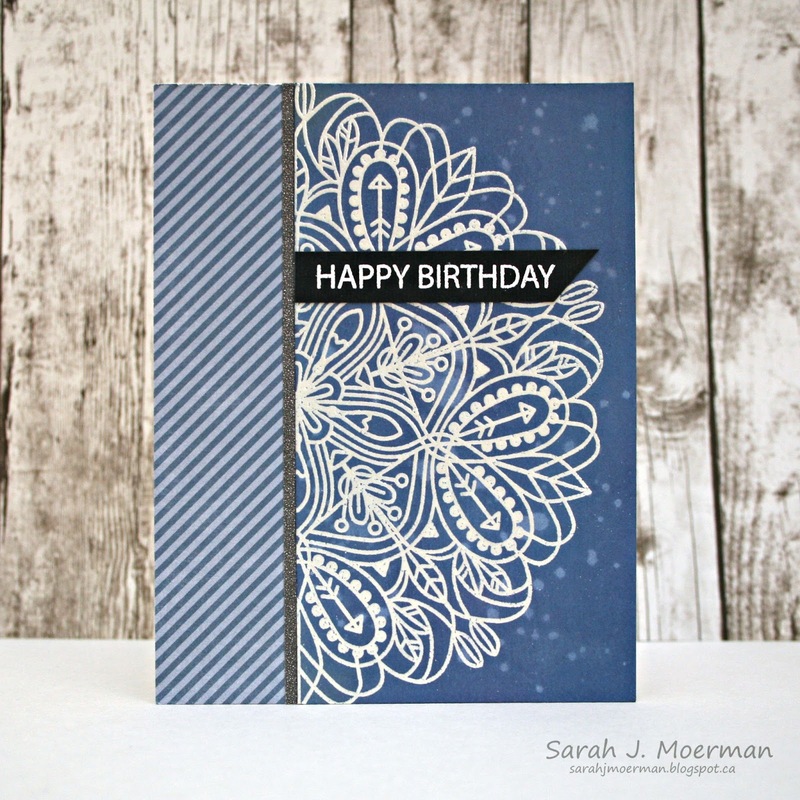 This was done on a notecard made from Simon's Ivory Cardstock. I added some Pinkfresh Let Your Heart Decide 6x6 Patterned Papers and a few more stickers to finish off the card. 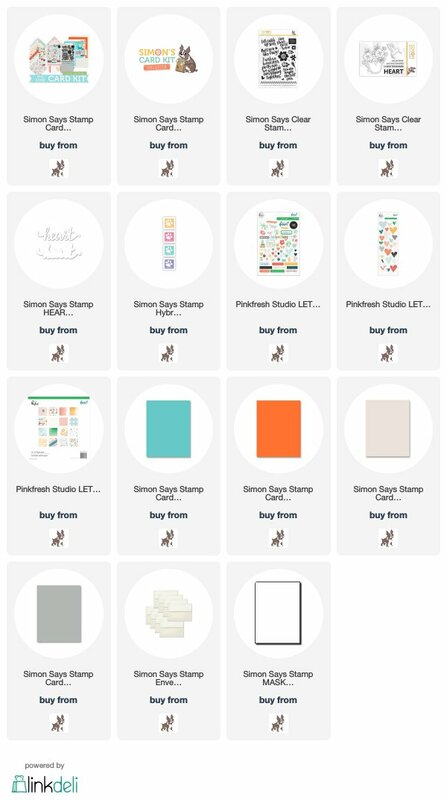 The Simon Says Stamp May Card Kit sells for $34.99 USD + shipping. If you'd like to receive this kit and future kits for $29.99 USD + shipping per month, you can SUBSCRIBE HERE. 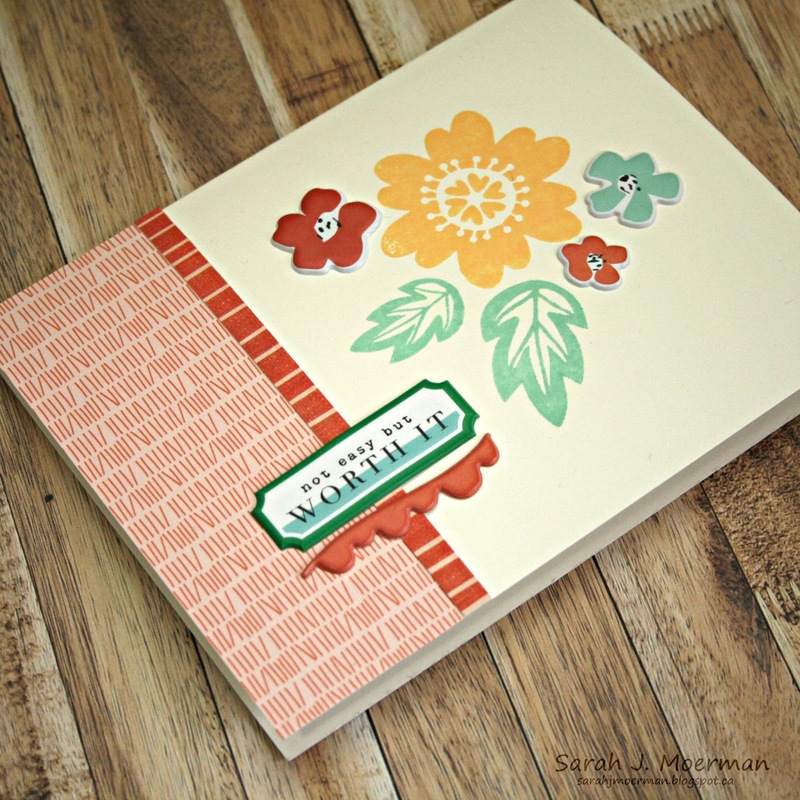 Heidi, owner of Simon Says Stamp, has given me an extra Simon Says Stamp May Card Kit to pass on to one of you! Just leave a comment on any or all of my May 2018 Card Kit posts and I'll announce a winner Monday April 30th. 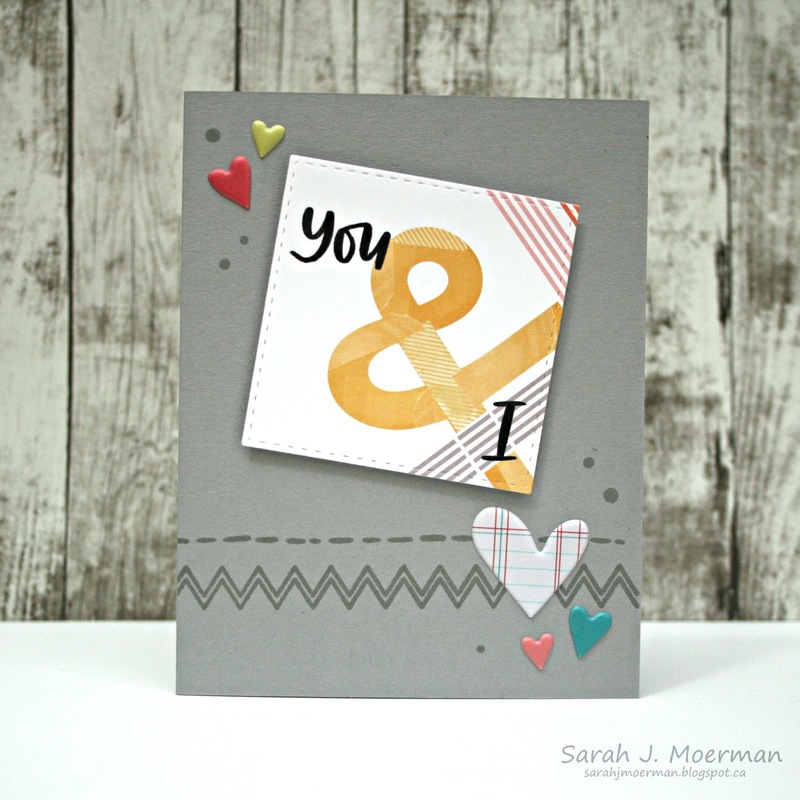 SSS May Card Kit: You & I (& GIVEAWAY)! 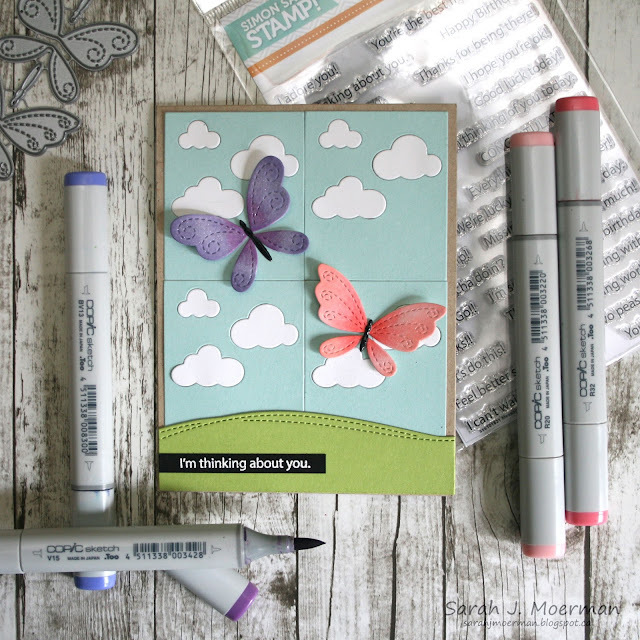 I'm back to share another card featuring the Simon Says Stamp May Card Kit: Kind Heart! For today's card I diecut the piece of Pinkfresh Let Your Heart Decide 6x6 patterned paper with the '&' symbol using one of Simon's Stitched Squares Dies. 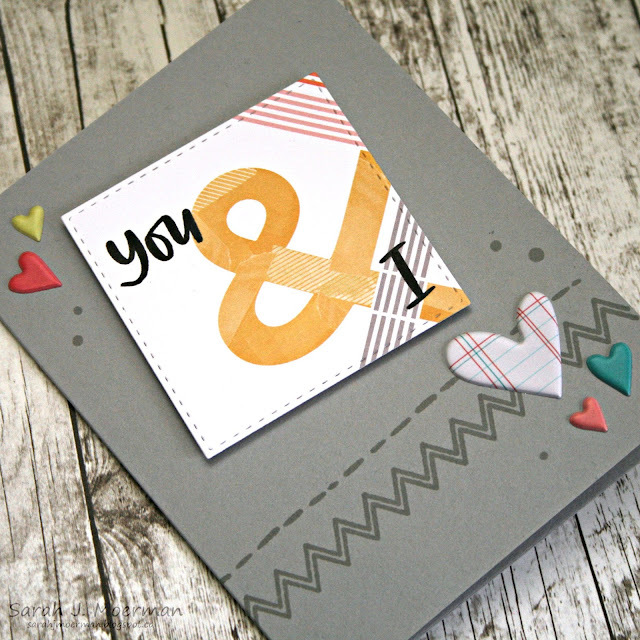 I masked off a couple of the stamps from Simon's new Everything Together Stamp Set so I could ink up just the 'I' and the 'You' with Versafine Onyx Black Ink before stamping the words on the diecut paper. I also stamped the borders and dots from the same stamp set onto one of Simon's Smoke Cards (made from their Smoke Cardstock) using Smoke Ink. I adhered the square panel to the card front with some fun foam underneath to add dimension and finished the card off with some Pinkfresh Let Your Heart Decide Puffy Stickers. It was quite the weekend here with a 34 hr power outage. Our whole town was basically shut down: grocery store, post office, everything! Fortunately we have a generator so we didn't lose any food and our house stayed warm. Unfortunately our sump pump wasn't working and more than half our basement was flooded. I spent most of Monday sucking water out of the carpeting downstairs. 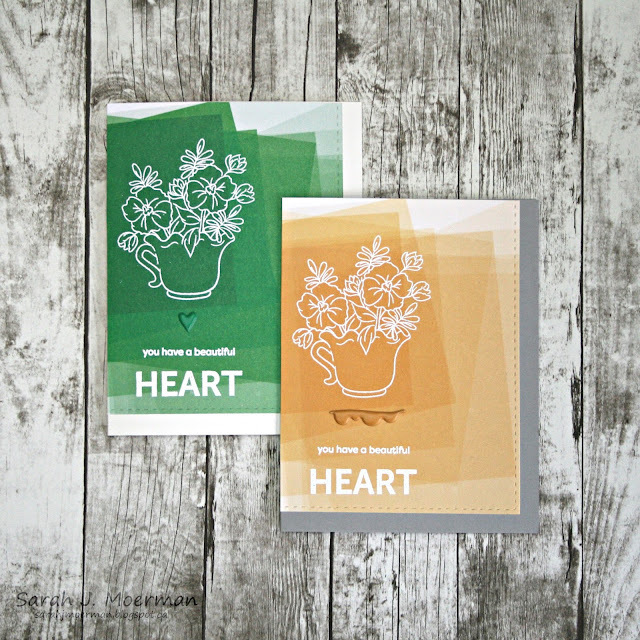 With that said, I'm glad to finally be here to share some cards featuring the beautiful Simon Says Stamp May Card Kit: Kind Heart! 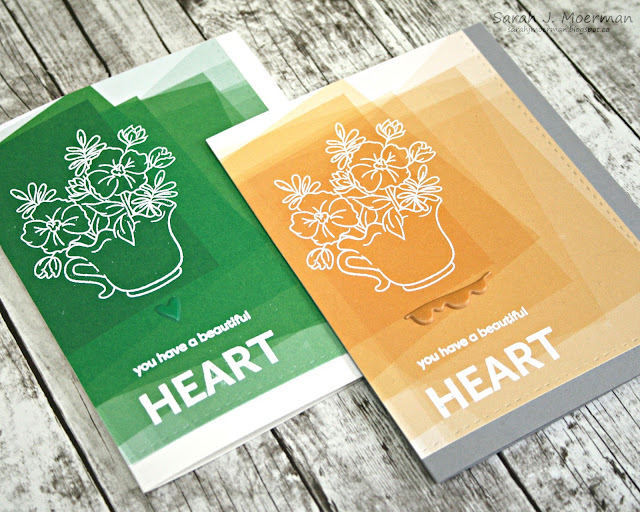 For these first cards I used the green and yellow ombre patterned papers from the Pinkfresh Let Your Heart Decide 6x6 papers. I diecut them with the rectangle from Simon's Bundle of Stitches Die Set, white heat embossed the floral image and sentiment from Simon's new Take Heart Stamp Set, and added an image each from the Pinkfresh Let Your Heart Decide Puffy Stickers. I adhered the yellow panel to one of Simon's Smoke Scored Cards and the green panel to a notecard made from Simon's Ivory Cardstock. For this next card I white heart embossed a sentiment from Simon's new Everything Together Stamp Set on a piece of Simon's Audrey Blue Cardstock that was diecut with one of Simon's Stitched Rectangles. I used an ink blending tool to add some of Simon's Spring Rain Hybrid Ink to the bottom of the panel, added some Pinkfresh Let You Heart Decide Puffy Stickers and Epoxy Heart Stickers, and adhered the panel to Simon's Smoke Scored Card. 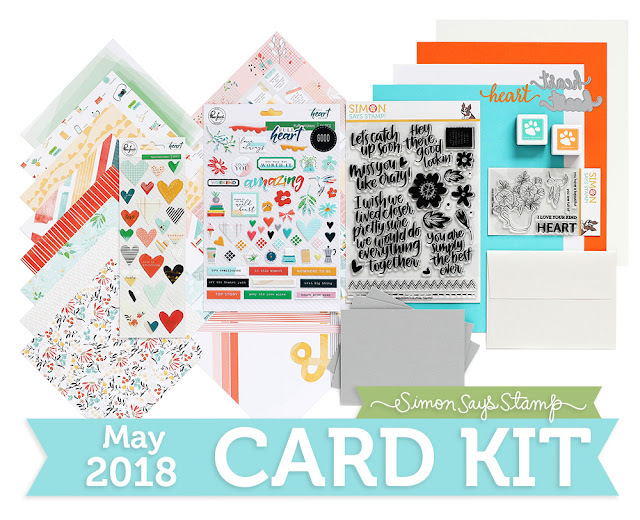 Simon Says Stamp May Card Kit Reveal! Today is reveal day for the Simon Says Stamp May Card Kit: Kind Heart! 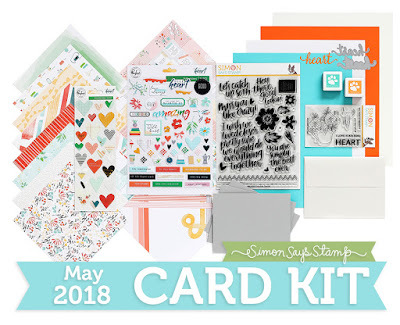 Here's a look at everything included in this month's kit. (Note: The two inks cubes included are Spring Rain and Melon. 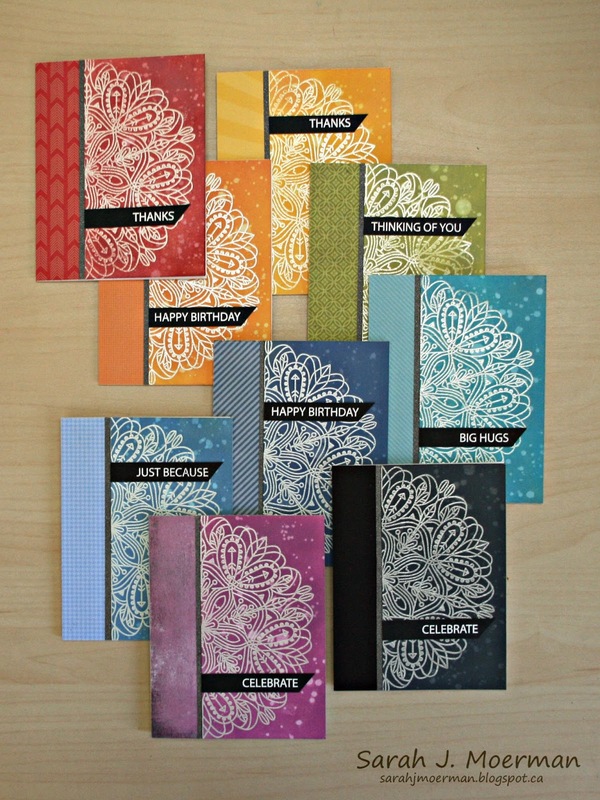 Simon has taken their Smoke cardstock and created notecards with it for this kit). 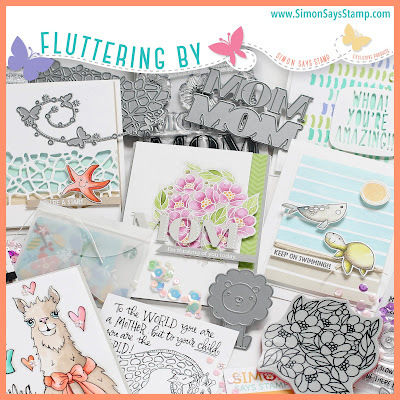 Today is release day for the new Simon Says Stamp Fluttering By Collection! 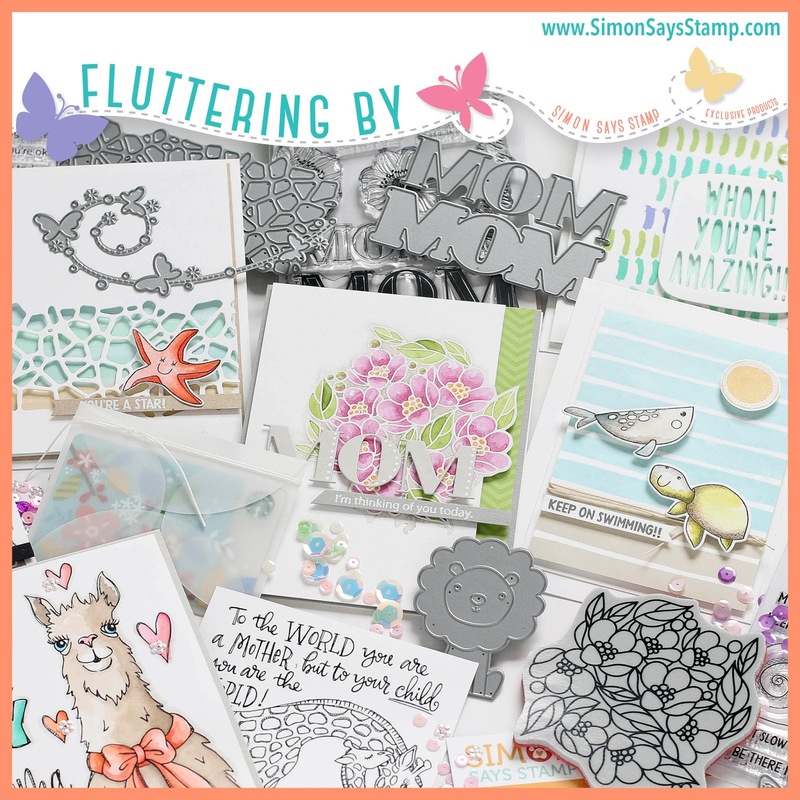 This first card is pretty self-explanitory with die cutting Simon's new Stitching Butterflies Dies along with their Picture Book Sky Background Die and Drifting Stitches Borders Dies. I coloured the butterflies with Copic Markers and a Clear Wink of Stella Glitter Marker, adding Glossy Accents to the bodies. The butterflies were added with foam adhesive to give them dimension. 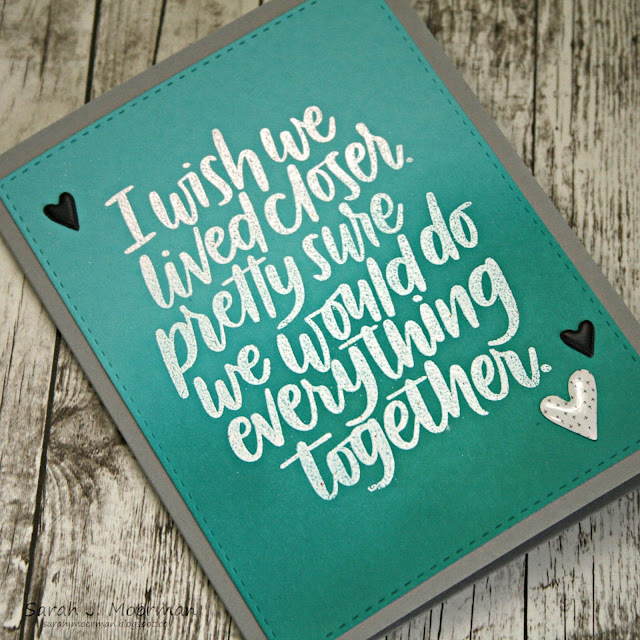 The sentiment from Simon's new Messages For Everyday Stamp Set (I LOVE this set!) 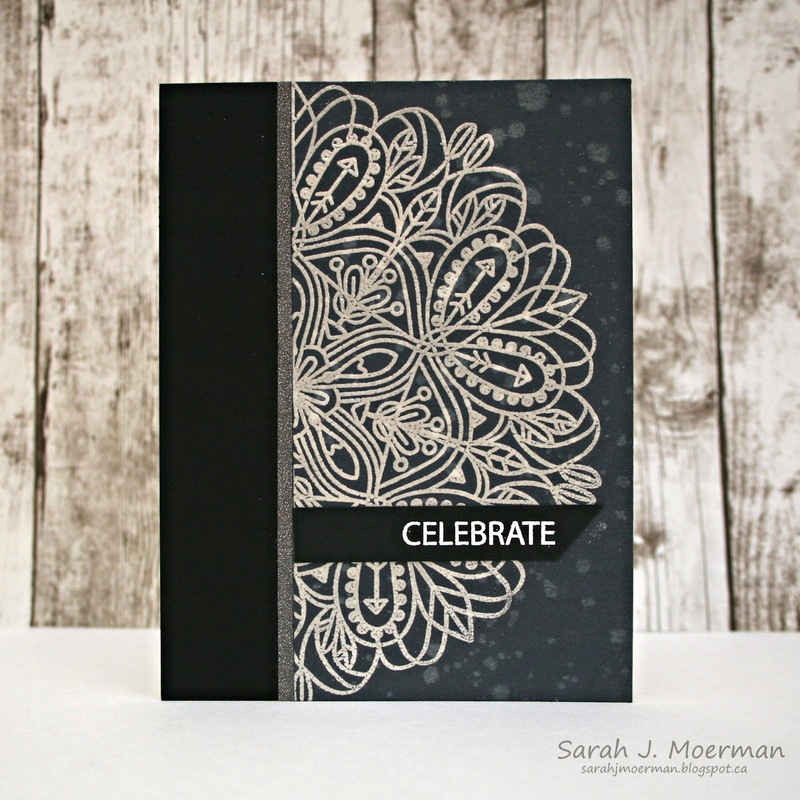 was white heat embossed on a strip of Simon's Black Cardstock. 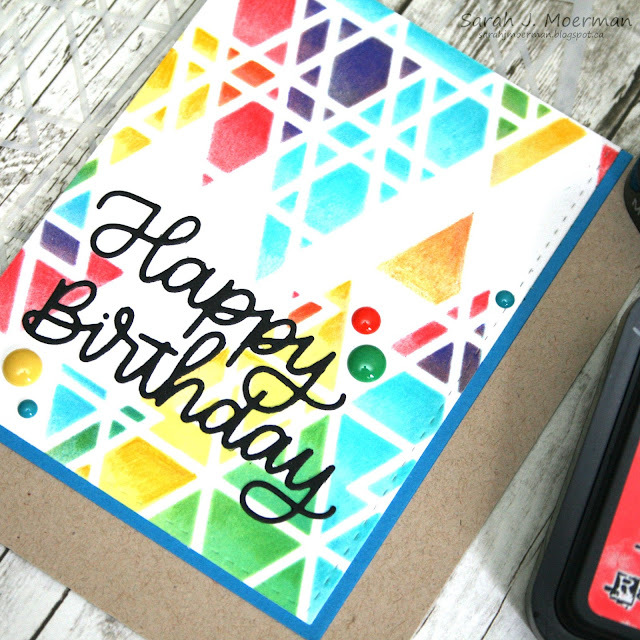 For this second card, I used Simon's new Abstract Triangle Stencil, masking off portions and adding Distress Inks with ink blending tools. I only used 3 ink colours: Abandoned Coral, Squeezed Lemonade, and Mermaid Lagoon. I used Prismacolor Pencils to add some depth and die cut the panel with the rectangle from Simon's Bundle of Stitches. I matted the panel with Simon's Island Blue Cardstock and adhered it to a notecard made from Desert Storm Cardstock. I die cut Simon's new Happy Birthday Script Die from Simon's Black Cardstock and added it to the card along with some enamel dots. I'm back today sharing some more cards featuring Simon Says Stamp Dies and Alcohol Inks. In THIS POST I shared Alcohol Ink backgrounds with vellum shapes on top. 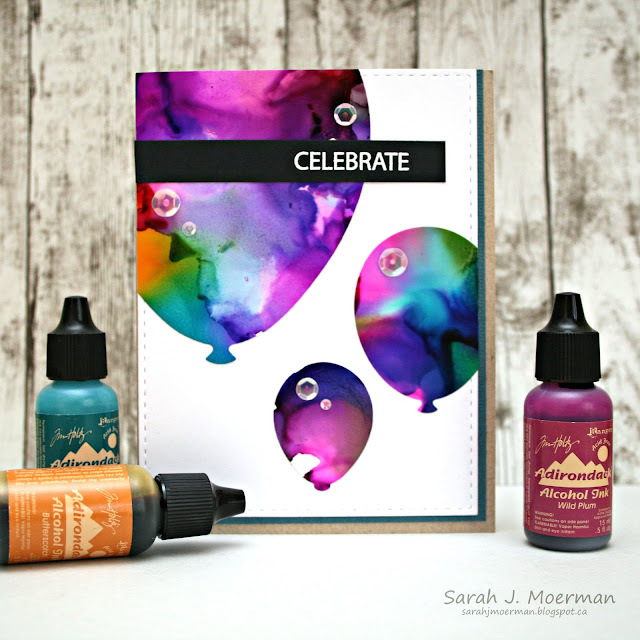 Today I'm sharing cards with Alcohol Ink pieces that have been diecut with Simon's Balloons, Talk Bubbles, and Hearts dies. 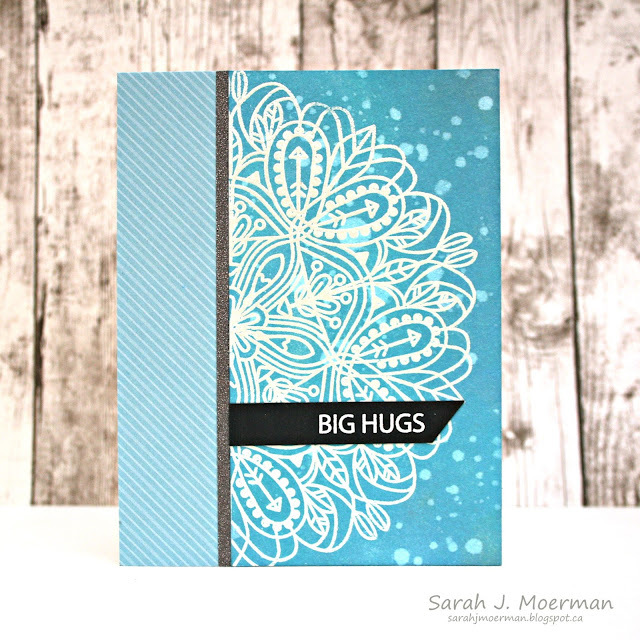 To create these cards I took a sheet of Yupo Paper and used three different colours of Alcohol Inks along with Snow Cap Mixative and Alcohol Blending Solution to create my backgrounds. 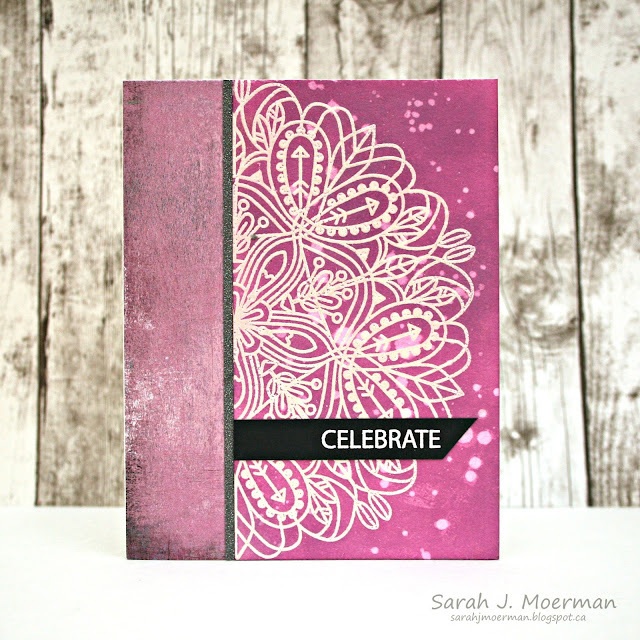 I moved the Alcohol Inks around with the Tim Holtz Distress Marker Spritzer Tool. 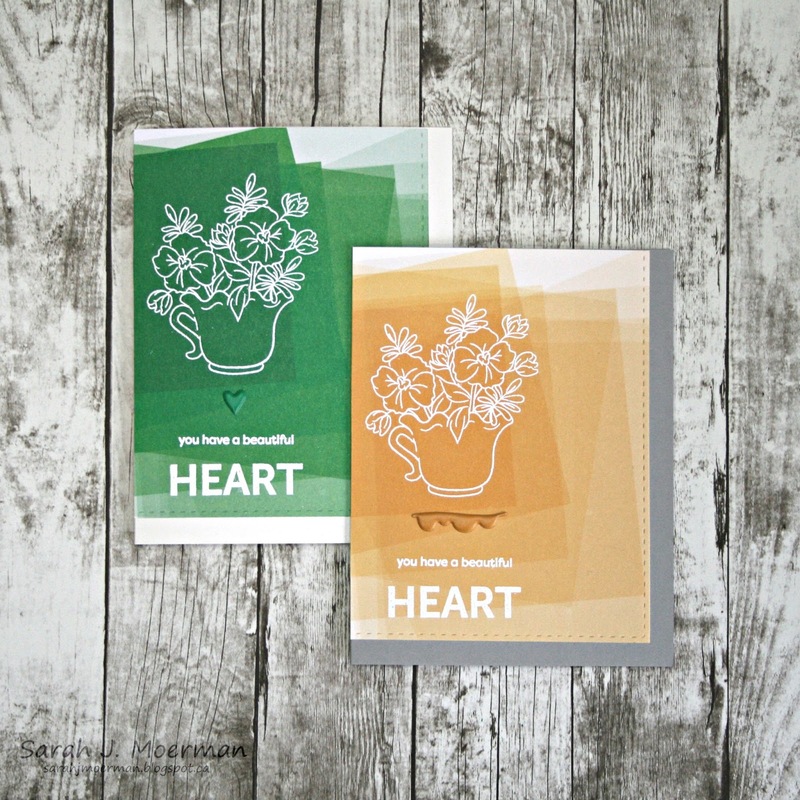 Once dry, I diecut the pieces using Simon's Balloons, Talk Bubbles, and Hearts dies. I adhered the shapes to Neenah White Cardstock that was die cut using Simon's Stitched Rectangle Dies, matted the panels with coloured cardstock and adhered the fronts to notecards made from Neenah Desert Storm Cardstock. I white heat embossed sentiments from Simon's Jumbo Stripes Stamp Set on Simon's Black Cardstock and finished the cards off with Lucy's Cards Clear Iridescent Sequins.